In the little town of Fleetwood in Pennsylvania Dutch territory, an unexpected industry took root at the turn of the 20th century. Along with their thorough knowledge of farming, many of the German settlers had also brought with them expertise in carriage making. But in 1905 automobiles were beginning to replace the horse-drawn vehicles and Josiah Johnson and Ephriam Hartman purchased the former warehouse of the Fleetwood Foundry and Machine Co. where they would manufacture automobile bodies. Sold and renamed the Fleetwood Metal Body Co. in 1909, the firm grew. Originally each body was unique and decidedly high-end. By 1917 the expensive and beautiful auto bodies were the favorites of screen idols like Mary Pickford, Theda Bara and Rudolph Valentino who had them built for their Duesenbergs, Packards, Lincolns and Cadillacs, among other fine cars. 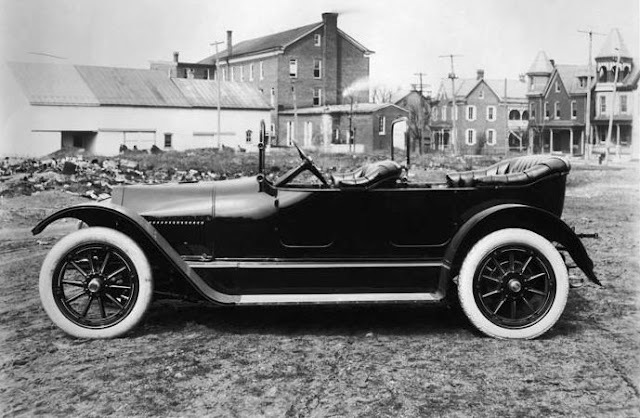 In 1914 Fleetwood photographed a touring car body in the rural hills of Pennsylvania. At a time when assembly line automobiles were, for the most part, black with canvas tops, Fleetwood’s bodies were painted in colors. Expert cabinetmakers custom-designed the interiors with matching woodwork that disguised amenities like vanity cases. Intricate inlays of exotic woods and metals embellished the door panels and concealed auxiliary seats that folded away. In 1918, at the same time that the company established New York offices on the 7th floor of No. 2 Columbus Circle along “automobile row” (approximately 40th to 70th Streets up Broadway), a showroom was opened to display the luxury bodies. Although by now many of the wealthy 5th Avenue residents had moved further north along Central Park, mansions still survived in the 50s and the business that had already encroached were quite exclusive. The Fleetwood Salon at No. 10 East 57th Street sat squarely in this fashionable neighborhood where the firm’s moneyed clients lived and shopped. The showroom was designed to slip quietly among its high-class neighbors. The two-story Mediterranean-inspired façade was at once fanciful and dignified. The wide, arched entrance held polished bronze doors that suggested a high-end jewelry store rather than an auto showroom. Rope-twisted columns, elaborate finials and a scrolled cornice added to the eye-catching design. In 1919, despite having a new plant only 2 years old, the factory had orders that would keep the 375 workers busy through 1921. Touring cars and roadsters sold for between $1800 and $2500, town cars and limousines were from $3000 to $3500 each. 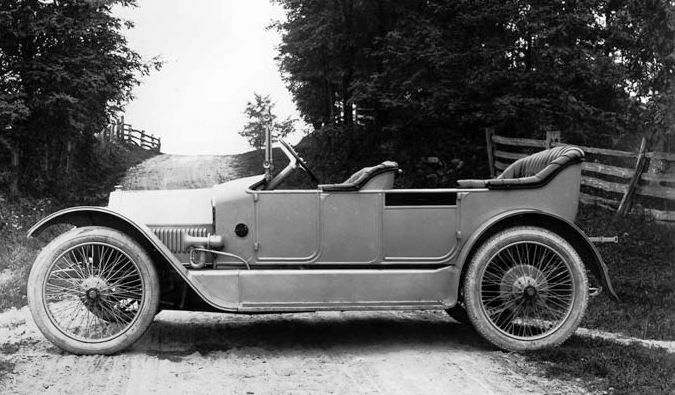 American moguls with names like Carnegie, Rockefeller and Vanderbilt all owned automobiles with Fleetwood-designed bodies. Letters poured into the office with minute specifications for custom bodies and interiors. Fleetwood bodies carried a prestige sought by owners like the Emperor of Japan, an Indian Prince, the Prime Minister of Canada and the President of Poland. Herbert Hoover purchased three Fleetwoods, all of them painted dark green and black. In 1925 General Motors was concerned about the survivability of the Cadillac brand. Edsel Ford had recently developed Ford’s own custom coachwork plant that drastically reduced the price of custom bodies. Lawrence P. Fisher of Fisher Body Corp. urged G.M. to take over Fleetwood, as it already had done with Fisher Body in 1919. On July 18 the board of directors of Fleetwood accepted General Motors’ offer of $650,000. The takeover did not diminish the quality of the Fleetwood bodies. While they were still displayed in the tony 50th Street showroom, the façade would soon be altered to read Cadillac Salon. 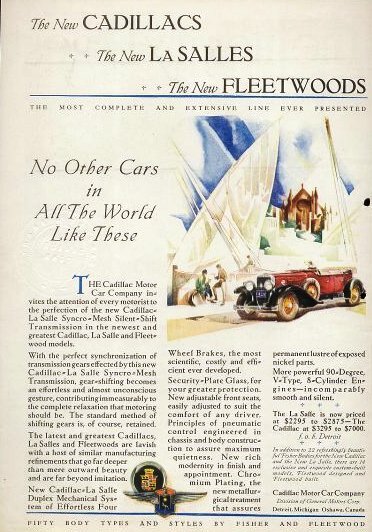 A 1927 advertisement displays Fleetwood's vibrant color combinations. General Motors built its 50-story New York headquarters at No. 767 5th Avenue between 1964 and 1968. 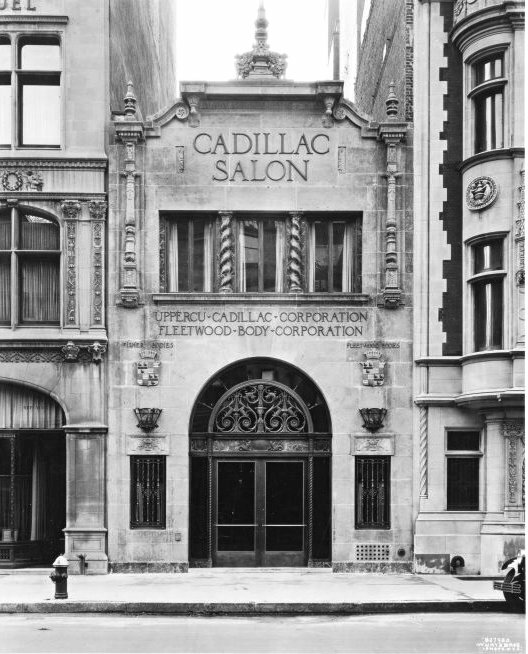 Today no hint of the proud Fleetwood Salon survives one block away on East 57th Street or of a time when princes and matinee idols bought custom-made car bodies. That isn't a cousin! That's a sibling separated at birth! Remarkable. Thanks for that very cool shot. It would be interesting to know the original use of the California cousin. Nice story. I live in Fleetwood. My grandfather worked there. Thank you for sharing this story.